Teaching in the natural environment (home and community) is where a child learns best. Therefore, our BCBA works closely with the parent/guardian to develop a treatment plan. In addition, our BCBA is happy to co-treat with other providers that are part of your team. A child tends to be most comfortable in a familiar environment. The treatment team can observe the child’s strengths and deficits in their natural setting. We are able to identify the immediate behaviors that should be targeted to gain independence through the day. Parents/siblings/other family members and caretakers get support through training of teaching strategies and interventions. We are successful because our team has a cohesive approach. As a result, your child’s 1:1 behavior specialist has direct access to your BCBA. This collaboration allows for constant communication about your child and their plan to ensure their growth. 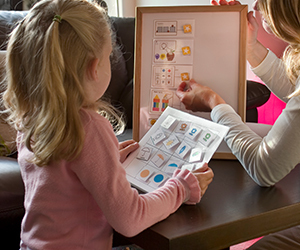 An individualized plan is developed based on your child’s individual needs as a result of an assessment tool, interview with parents, teachers and other professionals as well as direct observation. In addition, this plan is especially useful for developing an IEP with goals and objectives that are appropriate. Click here to learn more about our treatment plan. We work directly with parents and caretakers by training them in techniques to use in the natural environment. Parents and caretakers are observed and feedback is given in-vivo, making training realistic and effective.